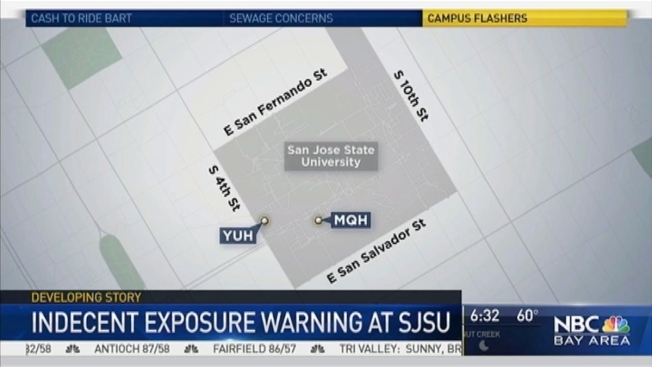 San Jose students received an alert this week about two flashers on campus. The first “indecent exposure” occurred on MacQuarrie Hall at an undetermined time in a classroom, the alert said. A young woman was in class when a man exposed himself to her. The second incident occurred on Tuesday about 11 a.m. in Yuchida Hall in a first floor hallway, the alert said, when a man approached a young woman and exposed himself. It’s not clear if it’s the same man, or two men, according to the alert, because the witness descriptions vary. In the first case, the woman said the suspect appeared to be African American. In the second case, the suspect was described as Latino or Indian with short, black hair, wearing a blue shirt and black basketball shorts. Neither woman was hurt and the suspect ran away in both cases.